A deli can be a great way to make a substantial profit, feeding customers while you simultaneously feed your love for cooking. High quality delis, though, are measured by the quality of the ingredients used to prepare the items on the menu. 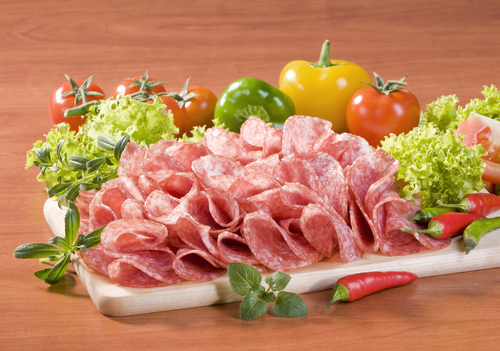 In a deli, freshness and quality are the keys to a tasty menu that will satisfy customers. Delis, unlike other restaurants, cannot rely on preserved ingredients or prepackaged food items. Deli food is made of fresh, whole ingredients. Sandwiches, salads, and soups must feature high quality ingredients that will support the quality of the finished product. Evaluating the quality of your deli's ingredients is an important first step to creating a restaurant with a great reputation. If possible, purchase whole food ingredients that have been certified organic by the USDA. An organic label involves more than just the absence of pesticides. Organic food is not treated with artificial hormones, and it does not contain any ingredients that can potentially harm humans. Organic food almost always has a richer, more authentic flavor when compared to other ingredients. Organic food may be more expensive, but it has a label that you can trust and equate with quality. It's important to be aware of hidden ingredients that can either be harmful or reduce the overall quality of your deli's ingredients. For example, some cured pork products contain nitrites and nitrates have been shown to have a negative effect on digestion. There are thousands of ingredients used to preserve foods or enhance food flavor, but not all of these ingredients contribute to overall quality. Pay attention to what is in the ingredients of your deli's products. One of the easiest ways to evaluate the quality of your deli's ingredients is to use your senses. Vegetables, for example, should feel firm and crisp to the touch. There should be no visual indication of rot such as dark spots or browning leaves. The freshness of meat is easily identifiable with the sense of smell. A foul or pungent odor means that meat has gone bad. Fresh meat should smell clean and virtually odorless. Perform a visual, tactile, and odor check on all your ingredients before you use them. Many consumers mistakenly think that big name brands are automatically equated with the highest quality ingredients. When you think of different food items such as ketchup, cheese, meat, and even vegetables, a few specific brand names likely come to mind. Do not make the mistake of assuming that the biggest name brands will provide you with the best ingredients for your deli. The opposite may be the case. When you are shopping for ingredients for your deli, it's important to treat every brand equally. Evaluate only the products themselves, and try to ignore the history or popularity of the brands that you are considering. Read ingredient labels, contact other restaurant owners to hear their opinions, and make decisions based on the facts without skewing the process with popular opinion.